Do you have a shelf of old books that you love, but rarely touch? Well why not give them a new lease of life and use them to create one of the 35 beautiful projects Clare Youngs has developed? You will discover ways to make greetings cards, stationery, animals, display scenes and more using pages from all kinds of different books. The beautiful typography and vintage-style artworks found in old books will add interesting colour, pattern and texture to designs such as the owl and pussycat pop-up scene. The illustrations in children's books give a charming feel to papier-mache dolls and a stand-up lion to decorate a kid's room, while maps and atlases work well on notebooks or birthday cards. Use elegant images from interiors books to decorate a wardrobe or cut away at a hardback book to make displays like the winter village scene. The designs use a variety of crafting techniques - from quilling to collage and decoupage - and each project has easy-to-follow instructions and step-by-step artworks. There's also a helpful techniques section at the back that will be of real use to first-time crafters, as well as a templates section. Clare Youngs studied graphic design and has worked in packaging design, illustration, and book jacket design. 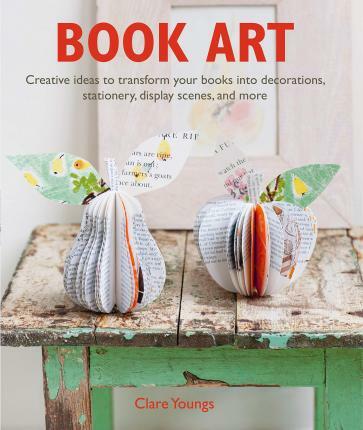 Her other books include Folded Book Art, Mobile Art, Wall Art, Make Your Own Woodland Creatures, A Year in Crafts, Letter Art, and Folk Art Needlecraft (all published by CICO Books). She is based in Broadstairs, Kent.